This block lets you overlash to cable bundles up to 2 in. (50mm) across ... and its affordability lets you use more blocks for smoother, neater lashing on new or rebuild construction. Ideally suited for messenger strands from 1/4 to 3/8 in. (6-10 mm). Easy to raise and attach with a Wire Raising Tool. A keeper retains the block on the messenger, and the fiber cable is positively retained in the block. The block's gritty non-skid surface rests against the strand and minimizes sliding during the pulling in of cable. 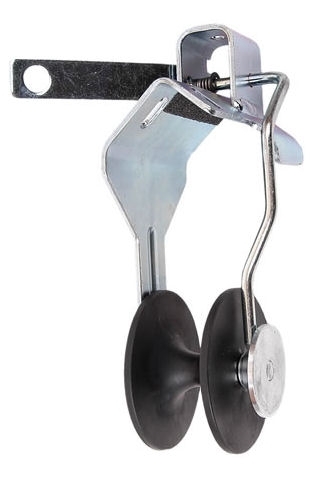 The frame is made of zinc-plated steel and is designed for the optimum strength-to-weight ratio. 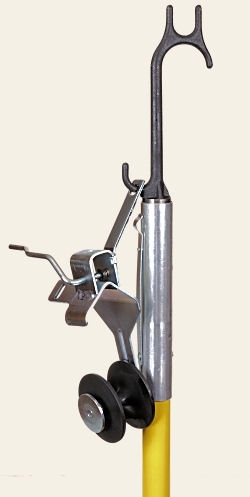 The frame is equipped with an anti-friction roller and a lever actuated keeper bar which encloses the cable in the block. Installation is straightforward. With the lever in the vertical position, just hook the block onto a wire raising tool through the hole in the lever and raise the block to hook it onto the strand. Now swing the lever to the horizontal position with the tool to close and lock the keeper bar into the detent. This block may also be used for placing small copper or coaxial cable as well.